Mt. 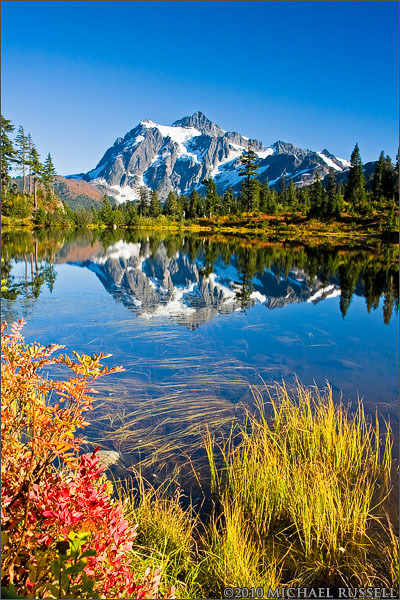 Shuksan reflected in Picture Lake. I have previously photographed Mt. Shuksan and Picture Lake but last Wednesday I was fortunate enough to have a near perfect reflection in the lake. No wind, no breeze, no monsoon. I knew that Mt. Shuksan was one of the most photographed mountains in the world, but even still I did not anticipate a lineup for various favoured viewing spots. Lots of photographers to talk to is nice though, ignoring the one guy who was pointing out to all the Canon users that he shot Nikon and was therefore in some manner superior. My heart skips a beat! Fabulous capture!! That’s an amazing reflection! Great light too.